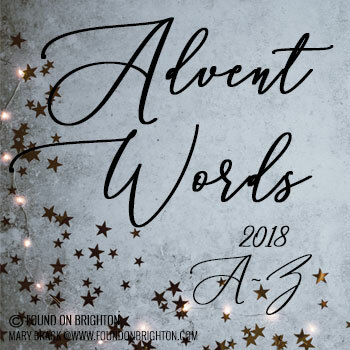 Found on Brighton: Advent Words 2018 A-Z Coming Soon! 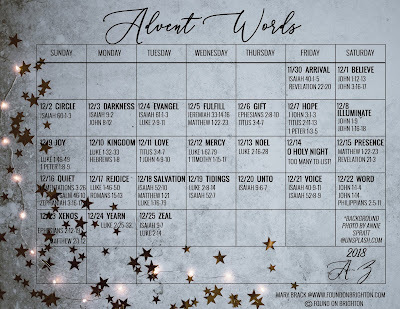 Our Advent Words challenge is just two days away! Are you ready to join us? Advent Words combines two of my top passions in life: Bible study and art. During a Words Challenge participants are provided with a daily Bible study/devotional for each word in the challenge. You are then encouraged to respond creatively with any creative practice they choose -art journaling, collage, photography, poetry, digital art, scrapbooking, calligraphy - whatever way you choose to interpret the word and Bible study creatively. In the days before the Advent season begins reflect and prepare: choose the creative form you will use for your daily practice. Make a journal if that fits your creative form.You can see my journal in this post. Download the calendar by clicking on the photo. If you would like to download and print the calendar without the background photo you will find it here.